Over the past 60 years, Stuart Briscoe's life stream has cut a very deep channel. Thousands of sermons preached. Hundreds of thousands of airline miles flown. All seven continents visited. More than 40 books written and an immeasurable number of people impacted for the Lord. Flowing Streams is Stuart's own story… of his life, his faith journey, and how the streams of others converged with his own to impact his path. Stuart explains the book title in this way, "If life is like a river, formative influences are like springs. They seep imperceptibly, unmistakably into the earliest beginnings of life's stream—and never leave." Writing his memoirs had never occurred to him, Stuart admits, because he didn't regard himself as “old enough for that sort of thing.” But, Flowing Streams is more than just the recollections of one man's life; it's an amazing message for each of us. It's a vision of what one person can be and do when armed with the power of Heaven and what God can accomplish in His name if we listen when He calls. 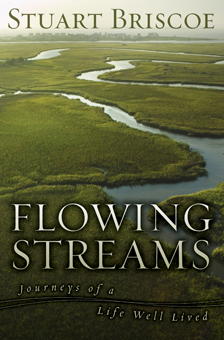 Successfully added Flowing Streams to your cart.